Please Note: The Flag Shop Edmonton will be close from Friday, April 19th to Monday, April 22nd inclusive for Easter Holiday. We have flags of all nations, Canada and provincial flags, banners, flagpoles, trade show banners, specialty flags and many other flag related products and hardware. We are your one stop shop for all your flag and banner needs in Edmonton, Alberta. We have many sizes and fabric selections available for Alberta flags both online and in-store. Call us or come visit our Edmonton Flag Shop! We are a store like no other and we look forward to seeing you. Looking For Alberta and Edmonton Flags? Edmonton Flag Shop carries a range of Alberta flags and Edmonton flags in various sizes and fabrics, contact our store for stock availability. Check out our products page. 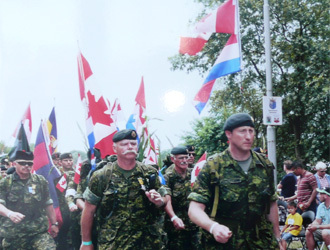 The Flag Shop Edmonton was approached by the Edmonton Garrison to supply flags for this event. We recommended sizes to them, and expedited the flags which were made in a very short period of time. They appreciated the efforts that we expended for them, and reciprocated by having this plaque made for us inscribed "To The Flag Shop in appreciation for your support of the 2010 Nijmegen marches"
We can custom sew or digitally print your personal or corporate flags and banners. We also carry a full line of flagpoles, banner rods and banner stands, pins, crests, decals, coats of arms, and many other exciting souvenirs. 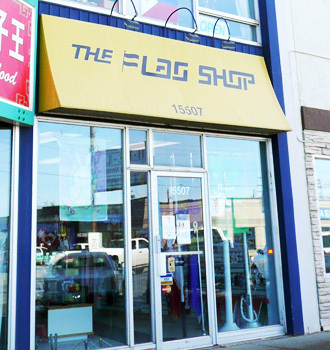 At The Flag Shop Edmonton, we offer top quality flag and banner products as well as unparalleled customer service. We always welcome your feedback on how we did today.